Skiing at Lake Tahoe/Tahoe Donner dates back to the mid 1800’s when John “Snowshoe” Thompson crossed over what is now Heavenly on his 90-mile mail route from northern Nevada to northern California, traversing a portion of the Sierra Nevada Mountain Range. Lake Tahoe/Tahoe Donner is ideally situated in the High Sierra, the snowiest region on the North American continent where snow is known to have fallen in every month of the year. The Sierra Nevada is directly in the path of huge Northern Pacific storms that swing in from the Gulf of Alaska, so the Lake Tahoe Basin gets routinely hammered with a ton of white gold, in a surprisingly short amount of time. In fact, the Lake Tahoe Basin gets more average annual snowfall than either Utah or Colorado! We invite you to explore this site and spend some time reading about each of the 16 major ski resorts in the Lake Tahoe Basin. Good luck deciding which resort to ski or ride first. Then again, you could just spend the entire winter in Tahoe Donner and experience all of them from one of our ski leases. On Donner Pass Road, half mi. off I-80 at Truckee-Donner Lake exit. A small family-oriented ski area located in the Tahoe-Donner area near Truckee, California. Two chair lifts and one surface lift. 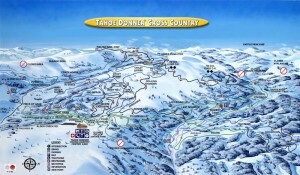 Tahoe Donner offers a convenient shuttle bus that runs daily from the Downhill Ski Area parking lot to the main ski lodge. Take Interstate 80 to the Donner State Park Exit. Travel east one-half mile to stoplight. Turn north onto Northwoods Boulevard. Follow signs to Cross Country Ski Area, approximately 5 miles (turn right on Fjord, left on Alder Creek). The terrain at Tahoe Donner XC is awesome. Three sections to ski, snowshoe or pulk sled (Home Range, Euer Valley, and Sunrise Bowl) make it an adventure every day. From the mellow loops at the Cross Country Center to the difficult loop at the Badlands, everyone should be happy. Euer Valley is beautiful – give yourself some time to explore, take a break at the Cook House, and take the Last Round Up home. 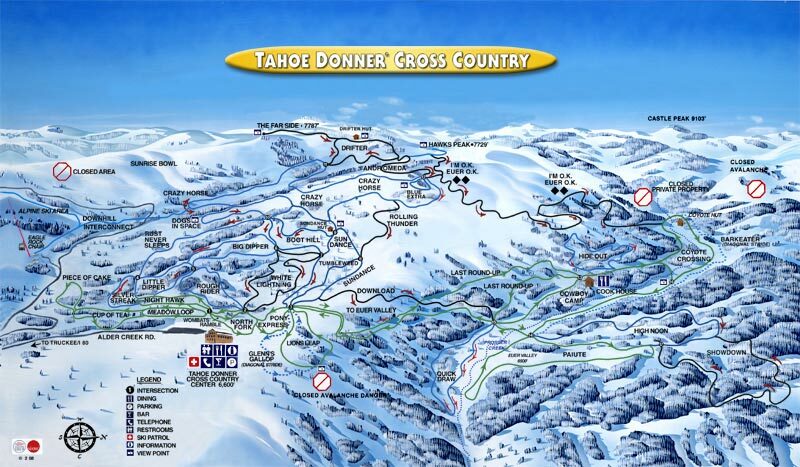 You can now ski to the alpine area at Tahoe Donner Ski Area. Meet the kids for lunch? Night skiing on Wednesday and Saturday nights from 5-8pm.